Huston, Frank C. (Orange, Indiana, September 12, 1871--October 14, 1959, Jacksonville, Florida). Both parents were musically inclined, and at the age of 12, he was playing cornet in a local concert band. By the age of 17, he was singing regularly in male and mixed voice units, and at 18, he was conducting church music. Education: Moody Bible Institute. Studied with W.M. Hackleman (a cousin), D.B. Towner, W.C. Caffin, and Charles H. Gabriel. On May 13, 1894, he married Bertha Martin. There were seven children. He spent a brief period as a public school teacher, then became a singing evangelist and traveled for a time with the Charles Reign Scoville Party. He served as Chaplain in the First World War and continued his interest and participation in patriotic organizations. He served a term as Commander-in-Chief of the Sons of Union Veterans of the Civil War and a term as national president of the Federated Patriotic Societies. 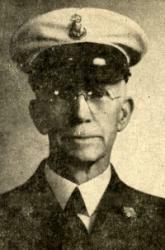 While in his eighties, he served as chaplain for the Jacksonville Chapter of the Coast Guard. He was ordained to the ministry of the Christian Church (Disciples of Christ) in 1915. He owned and operated his own publishing company in Indiana for a number of years and was a member of the American Society of Composers, Authors, and Publishers. Frank Huston is credited with more than 400 songs, some patriotic. His two best-known hymns, for which he wrote both words and music, are: "It Pays to Serve Jesus," written in 1909, and "The Christ of the Cross," which was copyrighted in 1924. Among the several hundred others are: "Keep on Believing," "The Word of God Shall Stand," "Lead On, O Christ, Thou Holy One," and "O Holy Day of Pentecost." A book, On Hundred Hymns and Gospel Songs, was published in 1955. For the last 18 years of his life, Huston lived in Florida Christian Home in Jacksonville, a home for the aged maintained by the Christian Church. There, he was active with his music and voluminous correspondence. Funeral services were held in the Edgewood Avenue Christian Church in Jacksonville, Florida, and interment was in Knightstown, Indiana.